Cu Sith is a dog (normally) and Ichneumon has nothing to do with dogs and cats, it is a mongoose. Wow, wow, wow, just wait a second here. There are 10 factions, each with 12 creatures. that mean about 120 creatures in total! and it is unacceptable to have 6 (by your count, although Raksasha is right, Cu Sith is a Dog but we made it look more like a tiger and Ichneumon is a rodent) feline based units in total? And if we count mammalian yes there are more, but still, should we also count humanoids, reptiles? I mean, what for then? We should just go back to either 8 units like in heroes 4 or the 7 units of heroes 3-5-6 and lower the number of factions. Having 120 units total though is impossible to not include duplicate ones. What we do try to do with Minastir is provide varietions. The visual look to be different, the role to be different. And i don;t think that we have made such a terrible work as let's say in Heroes VI or VII that they just offer recolored versions of units per se (see Direwolf that is remodeled heroes VI cerberus, see White tiger that is Shadow panther recolored and so on). Keep in mind that we pay close attention to everything you say and we discuss it with Minastir and keep in mind things that might need to be changed, such as the Baloth, or how to add Nightmare in Inferno and so on, but we want to fine tune the factions after we have posted all of them so that all of you can also get the bigger picture as well. It's just an observation: 6 out of 10 factions has a cat(like) creature. Do with that information what you will. Edited by Articun at 20:20, 03 Apr 2016. A new Faction comes to Inolin... One that comes from the depths of the ocean and remains unknown to the land people. How do you like Sanctuary in Inolin?? you forgot my all favorite one!! For a second I was "What the snow!? WHY!!?" And then I remembered it was april the first yesterday! BTW, you forgot the all powerful supreme ruler of the universe!! 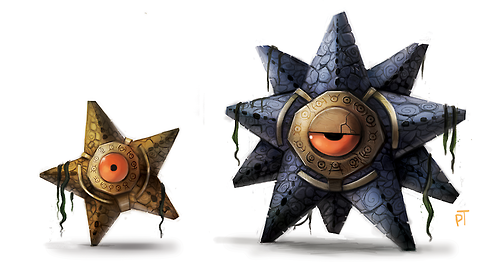 Actually there is a real Starmie from mythology, but it has the fire subtype instead of the water/psychic type. It's name is stella and it is from French Mythology. Magicarp is allready in the lineup mediczero!!! We just added the gyarados pic. No, gyarados is ****! you needed to make it magikarp -> Supreme lord magikarp! Okay, Sanctuary is ****ing awesome! The lore and lineup is all well done, and with a bit more inproved visuals (again, could probably have found some better pictures myself) it could be really awesome. I especially love the merfol turn you gave the faction. Really cool! Although, I have two tiny little problems. Firstly, why no naga. Why leave out the one unit the entire faction is based of, and furthermore is an iconic, classic, and not to mention exstreme good unit. You even used the word naga multiple times in the lore and you're telling me an octopus woman is more important!? The main naga is a must. If need be, get rid of the dog and move it around a little. Secondly, couldn't you have found a better kraken picture? While I do think a lot of the pictures could be better, this one obviously points toward you want to go with the clash of the titans bull****. There even no excuse for why not to pick a giant octopus, you already have a flying jellyfish! Been looking back at the other factions, it really is so much better than Ashanwannabeh7, just a remark: I would always pick Efreet and Manticore, and you know why? Because they are both missing from the lineups of H5! Maybe give the Buganne as alternative to Minotaur and the Thrasfyr as alternative to Succubus instead? I like the latest town! NO MERMAID IS SUPAH! Only creature I dislike is the ordinary house, kitchen and garden Sea Serpent. This is I think the closest so far I would like to create also. So I thought I could do the game engine in C++ (probably I am enough for this task). But we need a professional 3D graphical artist and a professional 3D programmer. Anyone interested (in working for free )? no on the kappa and the dog but the rest is super impressive! way to go guys! extremely interesting faction. me likey.